We’ve all heard of Moore’s Law, which posits that the number of transistors on a typical integrated circuit doubles every two years. But one of the overlooked side effects of such technological progress is the proliferation of cheap chips. For example, the price of Bluetooth ASICs, used in everything from audio devices to smart watches to fitness monitors, has dropped dramatically over the past few years. As a result, a growing number of small vendors are bringing stereo-Bluetooth headsets to market at prices that would have been unheard of just five years ago. I took a look at six budget-priced Bluetooth headphones to see if there are (finally) affordable options worth considering. When Able Planet was founded in 2006, the company initially focused on licensing noise canceling technology to other headphone makers. These days, Able Planet sells a range of consumer-focused headphones, including the $100 True Fidelity BT400B Wireless Headset. The BT400B lacks noise-canceling technology, but Able Planet touts the company’s Linx Audio technology as a key feature across most of the consumer headphone lineup. The BT400B is a behind-the-neck headphone: It uses a pair of lightweight, on-ear earpieces connected by a band that wraps behind your neck. The band has a matte texture, while the earpieces are glossy—though it’s not a high gloss, so it doesn’t seem especially prone to scratching. (My review sample was white, but Able Planet currently lists only black on its website.) The neck band folds in three locations so that the BT400B can be folded up for transport or storage. However, excessive play in the joints and some slightly discolored glue holding the wiring in place give the appearance of poor build quality. The foam earpiece covers are thin but still comfortable, likely in part because behind-the-neck headphones don’t typically exert much pressure on the ears—I was able to wear the BT400B for a couple hours without discomfort. The BT400B uses a mish-mash of switches and toggles for standard controls. A multi-function button, located on the face of the right earpiece, is used to initiate pairing, toggle power on and off, and control phone-call features. Track controls (previous and next) are implemented as two buttons along the edge of the earpiece. And, a rocker switch controls volume and playback functions. This volume/play switch was fussy in my testing: You rock the switch up or down for volume adjustment, and you press it to toggle play/pause; however, it often took me a few tries to activate the play/pause functionality. According to the company, its Linx Audio technology is a patented algorithm that tries to maximize clarity of human speech. This seems a laudable goal for audio playback, but in practice, the appeal isn’t so straightforward: Singers don’t always set out to perfectly enunciate lyrics. If anything, singers are taught to intentionally de-emphasize certain sounds to limit harshness or sibilance. As a result, I found the BT400B to be well suited to podcast listening, but music comes across too harsh and thin, as the lower mids and much of the bass are missing from the presentation. Similarly, in my listening tests, the soundstage was well centered, but it consistently presented itself slightly behind me, and no amount of repositioning of the headphones gave me an acceptable arrangement. For most of my source material, the projected soundstage was also extremely small, as there was no sense of a broad space across which a band was positioned. Rather, it seemed as though the band was seated directly beside and slightly behind me. I can’t be sure whether this audio character is due to the BT400B’s drivers or to the Linx Audio processing—there’s no way to disable the processing—but I suspect that most of the issues are due to the sound processing. As with most Bluetooth headphones on the market, the BT400B provides headset connectivity. You activate Siri, and answer and end phone calls, using the primary button on the side of the left earpiece. I didn’t find the BT400B’s microphone to be as good as, say, the inline microphone on Apple’s iPhone earphones—call quality was acceptable, but Siri accuracy was below average. In addition, a small tube leads from the exterior of the left earpiece into the microphone, which is recessed into the earpiece, and that tube has the potential to jam up with debris, further affecting the microphone performance. If your listening is exclusively limited to podcasts and spoken word, then the BT400B performs admirably. However, I have a hard time recommending the BT400B as a general-purpose set of headphones, especially once you factor in build quality and price. Eagle Tech’s $70 Arion ET-ARHP200BF-BR Foldable Bluetooth Headset, available in a range of six colors, is the least expensive model I tested. Unfortunately, the first pair I received had seen more than its fair share of review time, and the battery refused to hold a charge. The Arion has enough unique features, however, that I waited for a functional review sample instead of simply dropping it from the roundup. The first of those features is that the Arion is, inexplicably, the first pair of Bluetooth headphones I’ve tested—at any price—that provides a simple battery indicator on the headphones themselves: A small button on the right earpiece, when pressed, triggers a series of LEDs that give feedback on the remaining charge. (Some models, including the Arion, can at least display a battery indicator on your smartphone or tablet’s status bar.) It might seem like a lot to say about a seemingly mundane feature, but one of my biggest gripes while testing Bluetooth headphones over the past year has been having no idea how much charge remains and having a device die during use. However, the rest of the Arion appears to be composed of highly commoditized components. It seems to share more than a few parts, and an overall design, with a handful of other models on the market, including the Subjekt Pulse, covered below. To the credit of Eagle Tech, the company has added the unique battery-level indicator, as well as modified audio alerts: Instead of basic beeps and tones indicating power and connection status, the Arion features a synthesized voice that, for example, speaks “Power On” when the headphones are turned on. I listened to a variety of music with the Arion and it doesn’t stray far from other headphones of this design: The midrange and mid-bass are scooped out which gives a muffled or hazy presentation. The bass is limited but acceptable for most music. Other positive aspects of the Arion include a solid built-in microphone. I had great success in terms of accuracy with Siri and dictation. This was an unexpected difference from the Subjekt Pulse, which I had tested before the Arion. Voice quality on calls was acceptable; I suspect the quality was limited more by my cellular connection than by the microphone hardware. And while Eagle Tech claims 13 hours of playback time, which is about average for headphones in this price class, I found battery life to be at least that good. I was generally able to go over a week between charges. For ease of use, portability, and the convenience of always knowing how much charge is remaining, the Arion is an easy recommendation, especially given its low price. Eagle Tech has taken a commoditized design, added some nice touches, and come out with a respectable headphone that manages to differentiate itself from the crowd. Manhattan’s $110 Flyte Wireless Headset is a visual departure from other headphones in the review. The company says the Flyte is meant to invoke 1960s and 1970s sci-fi, and, indeed, I would describe the look as retro space age. While the materials and construction are comparable to those of the other headphones in this price range, there is just more of that plastic. However, when it comes to practicality, I found the Flyte to be bulky without any real benefit from the added volume. And, oddly, I found the headband to be on the small size: Despite the Flyte’s very good ear cushions, I had sore ears after an hour or so of listening. If you have a smaller head, you may be fine, but if your head tends to the large side, this isn’t the headphone for you. The layout of the Flyte’s playback control buttons is unique among Bluetooth headphones I’ve seen. Rather than grouping all those buttons onto one earpiece, the controls are split across both earpieces. Track-forward and -back and volume buttons are arranged in a four-way button on the left side, while the play/pause/answer/connect button is located on the right earpiece. I found the switches to be well designed, providing positive feedback and requiring just a comfortable click to activate. The Flyte’s power switch is a discrete slider located on the inside of the headband, just above the left ear. The biggest disappointment with the Flyte came when I turned them on. Manhattan touts the Flyte’s “outstanding 3D stereo surround” using an audio-processing feature that can’t be disabled. But that processor makes all audio sound like it’s being played inside an echo chamber. The additional reverb is difficult to pick up in synthesized pop music, but with anything outside of that genre, the result is a poor listening experience. Similarly, in my testing the built-in microphone was poor at providing accurate input for either Siri or dictation. The company claims that the Flyte offers eight hours of music listening on a charge (or 12 hours of chat time or up to 24 hours of standby time). In my experience, the battery life was better than quoted. Like the Arion, the Flyte displays a battery-level indicator in the iOS status bar, though it has no indicator on the headphone itself. As bad as my impression is of the Flyte, it really is only a few changes away from being a competent set of headphones. Just eliminating the “3D stereo sound” feature would likely go a long way towards making the Flyte worthy of consideration. I’d also like to see some tweaks to the headband geometry to reduce the pressure on the ears. I can’t recommend the Flyte in its current configuration. 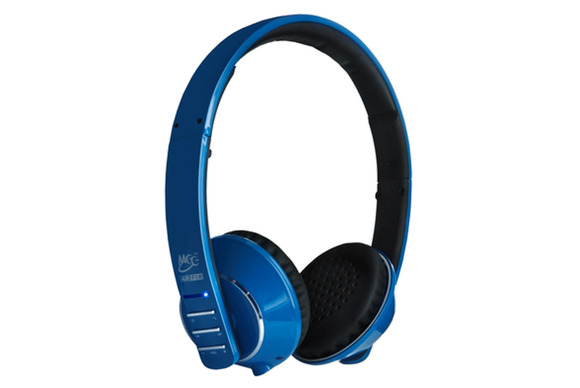 MEElectronics’s $100 Air-Fi Runaway AF32 Stereo Bluetooth Wireless Headphones, available in six colors, is the company’s entry-level Bluetooth headset. The AF32 uses high-gloss plastic for the headband and earcups, while a leatherette material covers the inside of the headband and the earpads. The narrow headband and flimsy-feeling plastic make the AF32 feel less than durable, but I found no issues over several weeks of daily use. Overall, I found the AF32 to be among the most comfortable on-ear heaphones I’ve used, at any price, thanks to the combination of light headband compression and the shape of (and cushion on) the earpad. When it comes to audio quality, the AF32 performs admirably with my particular mix of music and podcast listening. Bass is better developed than with most other headphones in this price range, and though the small driver size limits any visceral sense of bass, that’s true of any headphone below a certain size. Midrange frequencies are a bit subdued—a flaw most apparent with vocals—but and the highs don’t come across as harsh. Overall, the sound is a bit thin and slightly muted, but better than expected. The built-in microphone was decent with both Siri and dictation, which is (sadly) above average as far as headphone microphones go. Voice quality on calls was acceptable, as well. Battery life is claimed to be “over 12 hours" of playback,” which seemed accurate to me, as I could go about a week of daily commute listening between charges. My biggest complaint with the AF32 was with the control layout. Limited by the narrow headband, the controls consist of three horizontal rocker switches (a “multifunction” button on top, track controls in the middle, and volume controls at the bottom), located just below a raised, horizontal indicator light. I put multifunction in quotes because using a two-way switch, with ambiguous actuation points, to trigger four different functions was an exercise in frustration. The only function that worked consistently was power on/off, and even then, I would often trigger another function as the AF32 powered down. Between never being quite certain of the relative locations of the track- and volume-control buttons, and the seemingly random behavior of the multifunction button, the control scheme left much to be desired. That said, the positives of the AF32—namely comfort, above-average sound quality, and solid battery life—outweigh the complaints I have about the controls, making it a good choice in this price range. The fact that the AF32 can often be for considerably less than its $100 list price makes it even more compelling.